Save $200 on a 5 BBL Conical Fermenter! Coupon Description: Okay, I know what you are thinking… Hey jackhole, this is “Home” Brewing deal webiste, why are you listing a deal on a 5 BBL Stainless Steel Conical Fermenter? Well, we all have dreams right? Some home brewers have aspirations of opening their own brewery and if they do, they are going to need larger equipment! So this deal is for all of the dreamers and at the very least, this might give you an idea of how much a 5 BBL Brewing Setup is going to cost you if you ever make the jump. Right now MoreBeer has these on sale for $6,395. These heavy duty stainless steel beer tanks are built for longevity, quality, and cost effectiveness. They also includes a hefty list of quality features to ease the brewing process. This 5 BBL Conical Fermenter is built from high quality 304 grade stainless steel and are covered with a dimpled jacket that allows for easy integration with a new or an existing glycol system,. They are then covered in another layer of polyurethane insulation foam and another sheet of stainless steel to minimize heat transfer. Here are some of the features of this beautiful 5 bbl stainless steel beer fermenter. 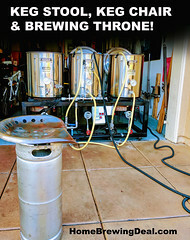 Coupon Description: HomebrewSupply.com has a deal of the day that will save you $20 on a Mark II Keg, Carboy and Homebrewing Equipment Washer! The Mark II Keg and Carboy Washer is a much needed system for cleaning carboys, buckets, and kegs alike. With a stain proof and chemically resistant basin, you’ll be able to use this cleaner for all of your cleaning needs without worrying about corrosion from cleaners or stains from even the darkest wines. This is going to cut your brewday cleaning time drastically! Save on over 200 Items at the Adventures in Hombrewing Warehouse Clearance Sale! 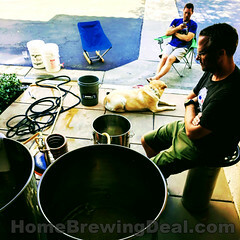 Sale Description: Save on over 200 Home Brewing Items at the Adventures in Homebrewing Clearance Sale. Click the link to view all of the items that currently have their prices slashed! Plus free shipping offers on many items! Coupon Description: Today at More Beer you can save $25 On A 2 Tap Draft Beer Tower! This home brewing draft beer tower kit includes the following: 4′ of 3/16″ ID Beer line and tail piece/hex nut for connection to commercial sanke sytle keg. If you are a homebrewer using Cornelius style kegs you can cut off the hex nut and attach a beverage out quick disconnects. Coupon Description: Copper Counterflow Wort Chillers are one of the most efficient, compact and hassle free wort chillers around. Right now you can save yourself $45 on one at MoreBeer with promo code BEERDEAL! The Chillus Convolutus Wort Chiller with threaded 1/2″ fittings on the in and the out. This make connecting with pipe fittings, qd’s or tric-clamp possible. 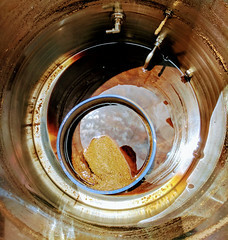 The inner tube is made from 12′ of 5/8″ convoluted copper which continually turbulates the wort as it flows through. The outer tube is made from 7/8″ copper. 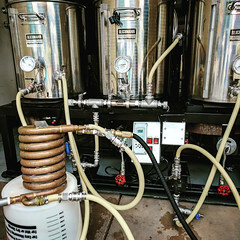 The Convolutus counterflow chiller allows you to pump wort through without having to restrict your pump to slow down flow.